A script editor in the customizer > advanced panel > additional scripts. Can be typically used to add Google Analytics code or any custom scripts or stylesheets. A carousel for gallery post formats. Any post set to the Gallery post format, will display the embedded gallery as a carousel in lists of posts : masonry and alternate thumbnails type. You can see it live here and here. A sidebar layout option for attachments just like for posts and pages. A new option to control the visibility of the slider navigation bullets. Implement #1207. If you are using a cache plugin like Total Cache, or Super Cache, make sure you clear your cache after the theme update. This release is compatible with the next version 4.9 of WordPress that will be released in early November 2017. The modern theme is amazing, but it is just too slow. Hi, we’ve been working on performance improvements in v2.0.15. You can test the demo site on desktop and mobile. Let me know if it is still slow for you. Out of curiosity, what is the plugin you are using to make you sidebar sticky on scroll ? This is a feature that we are working on for the theme. Oh that? It is called “q2w3” weird name. Updated my site and now it’s even slower. Can you test your website on https://tools.pingdom.com/ and Gt Metrix and check what kind of results you are getting ? Make sure you enable the lazing loading options first in customizer > advanced options > performances. Oh no Nick, I’m using google page speed insights. My Google search position dropped like a rock. Waiting for the next update. Has this “A carousel for gallery post formats. Any post set to the Gallery post format, will display the embedded gallery as a carousel in lists of posts : masonry and alternate thumbnails type. You can see it live here and here.” actually been implemented or is it planned? I’ve tried playing with it and either I don’t understand what how to achieve it or it isn’t working. I would like to ask a question. After playing with it some more and looking more closely at the demos… is that only going to be available in the new Modern Style of Customizr Pro? If we are still using the classic style will we be able to use this new feature? Hi, yes this feature is implemented for the modern style for the moment. We are preparing a documentation about this. Thanks so much, Nicolas!! Great idea on the anchor link!! Thanks also for the upcoming search icon in header!! I saw in GitHub about how the quotes had to be removed from the 404 and Search Not Found pages. I understand that accuracy is paramount, but now the pages are boring! The previous quotes were really perfect for my blog!! I hope you guys are going to add options for formatting those pages (“insert your quote here” etc). One day this week I’m going to try and research more accurate quotes to express the same sentiments, in case that is helpful!! LOVE the concept!! I like the new modern style of your theme. I’m working with the pro version and actually starting to built my new site. My database crashed and so I started to built a completely new site. I’m not so happy with the style of the mobile menue. Is there a possibility to change the fact, that all items are open? Think about click on the parent items to open the childs? I have used Max Mega Menue for my previous site. 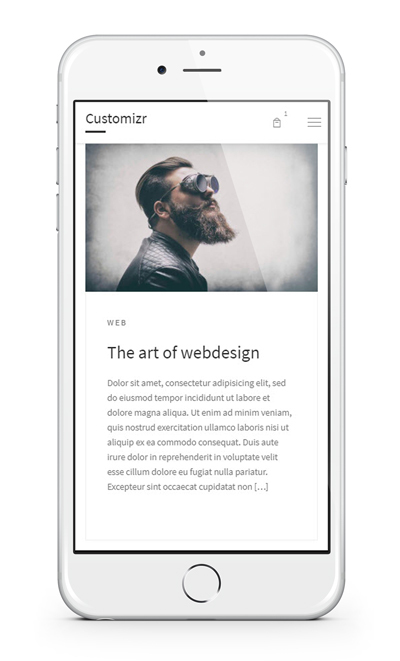 The mobile menue looked nice but I would like to built my new site without the plugin. Do you have some advices how to manage the mobile menue more comfortable? Thanks a lot. P.S. Because I could not see my comment on my PC I post it again. Sorry, when it is a second comment now. Thank you for this feedback. We already started to discuss this option internally. For now, we’ve been focusing on designing a clean menu for mobile, with a non intrusive reveal effect on scroll up by default. Customizing the menu navigation for child element is the next step, and your request shows me that this is expected by our users. We’ll try to introduce the expand on click as soon as possible. that sounds great 🙂 Thanks a lot. I have updated to Customizr Pro on one of my websites and the front page, home page of my website started getting a %)# error message. I then deactivated Customizr pro for customizr and that front/home page was fine. Hi, please open a support ticket for your issue. Does this update include the Search field in the header (to help with Infinite Scroll)?? Sorry to sound dumb, but there are a few things on the list that I just don’t know what they are. Anchor scroll, for example. We could not include the search icon in the header in this release unfortunately but this is in our next batch of improvements. The anchor scroll is the scrolling effect that you can get when clicking on an internal link anchor. You can see an example on this page, if you click on the comment link, just beneath the main title. Thanks Nicolas! You guys are awesome! !